Warm, inviting, and as comfortable as an old pair of jeans. Whenever I first listen to a new album by a favorite artist, I often find myself nervously worrying that I might not like it. Sometimes, I even put off listening, just so that I can have one more day of still appreciating the musician or songwriter before (what I fear to be) a crushing disappointment. I blame Ani DiFranco's jazz phase for this. But I digress. 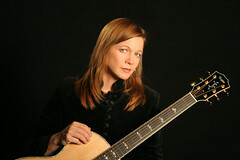 Carrie Newcomer is a long-time favorite of mine, and I was pleased to see that she had recorded another album, the first in several years. The Geography of Light will be released on February 12, but I have had the pleasure of being able to listen to a preview copy for a while now. Except that I was too worried that it might disappoint that I kept putting it off. I should not have worried. The Geography of Light features both the luscious acoustic contemporary folk that drew me to Newcomer on her first solo album, Visions and Dreams, as well as the storytelling that brings to life the characters described, as on her last album, Regulars and Refugees. The album also contains songs that focus on spirituality, as she has done in the past. Newcomer's take on modern, progressive spirituality is accessible for people of many faiths, and she approaches it with the same sensitivity that she brings to all of her songwriting. In fact, if one is not paying close attention, the songs seem to stem more from basic human truths than any sort of discernible theology. You can't always tell one from another. And it's best not to judge a book by it's tattered cover. We have come to believe there's hidden good in common things. You can't always tell but sometimes you just know. Newcomer's lyrics don't always fall along serious lines, such as with the bonus track, "Don't Push Send." The song is a tongue-in-cheek take on the perils of modern communication tools, and provides a variety of cautionary tales of email blunders. I have been intrigued by the use of the bouzouki in contemporary folk music over the past decade or so. It has similar kind of delicately plucked quality as a mandolin, but the notes can be sustained longer, thus not requiring the frantic vibrato-like strumming that is traditionally done on the mandolin. This is the perfect counterpoint to the melody sung by Newcomer on "Two Toasts," and it is another example of the thoughtful arrangements that characterize her catalog of music. She makes use of the instrument throughout the album, and seems to have easily incorporated it into her songwriting. With the first pull of the bow across a violin strings and the pluck of an acoustic guitar, I knew immediately that The Geography of Light was going to be everything that I love about Carrie Newcomer's music. Warm, inviting, and as comfortable as an old pair of jeans. This is the flip side of my hesitation — I could have been listing to this gorgeous album for the past month or so, but I let worry encourage my habitual procrastination. Don't make the same mistake.